Finish the fiction picture book that is almost done. Finish the nonfiction picture book that is almost done. Write a new article for CBI/the editor is waiting. Rewrite the play for Schoolwide because that editor is waiting too. Work on a highly marketable nonfiction book idea – must be submitted by 9/1. Check out two new-to-me agents. Write an alphabet book while this particular market is looking. The reality is that each of us has to set our own priorities based on our goals and our situation. 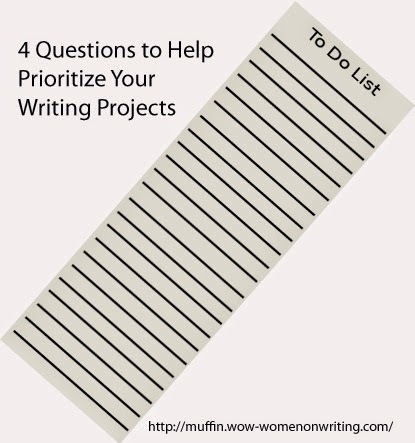 Here are five questions to ask yourself as you decide which project to work on next. How much writing time do I have? A friend of mine is a stay-at-home dad. His children are both preschool aged and he has only a limited amount of writing time. This means that short projects go to the top of his list. Am I writing for fun or profit? I make my living as a writer. This means that projects with a readymade market move to the top of the list. Projects that pay well take priority over those that pay poorly. Is this a temporary opportunity? A group of us attended a writing retreat in April. The editor who led the retreat will accept work from us only from 6/1 through 9/1. If I’m going to submit to her, I need to get the project done. Am I hiding behind my list? Writing is a scary business. You put yourself on the page and then send it out to strangers. It is easy to hide behind safe writing and avoid working on something that, while dear to our hearts, is risky. Do I need to temporarily reprioritize? Circumstances change and our plans often need to change along with them. In the summer, I’m a swim team mom of one pre-driving boy. This means that my writing time is limited for 2 ½ months out of the year. From June through July, my priorities change. I’ve created a prioritized list of projects based on my own answers to these questions. Answer them yourself to prioritize your own projects, but remember. This list isn’t permanent and you may need to re-examine things in a few weeks. It's been a crazy summer. . .